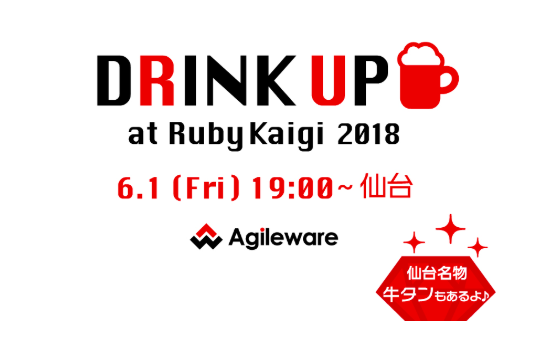 We at Agileware will host a Drinkup this year, too. We will provide casual Italian food and beef tongue, Sendai's local speciality, which you can enjoy during our event, which is of course All-You-Can-Drink style. There's only a limited amount of seats, but enjoy a relaxed evening after the RubyKaigi main event! This year, too, we are looking LT (Lightning Talk) speakers at our event. Every speaker will receive a 1000 Yen Amazon Gift Coupon as compensation. You can talk about anything tech-related (VR, IoT, AI, etc), even topics unrelated to Ruby. We are looking forward to your talks. We are a software development company based in Osaka that specializes in Agile methods and Ruby. Our three main focuses are contracted development, our project management tool "Lychee Redmine" and our real-time meeting minute service "GIJI". We are always pursuing to maximize customer and employee satisfaction. Agileware is hiring. We offer flexible working conditions ranging from full-time employment, fixed-term contracts, part-time or working remotely from home. If you are interested, feel free to contact us. Kawamoto436 published アジャイルウェア・ドリンクアップ at RubyKaigi 2018.